The SOLFRUNT 1933 process gauge has 316L SST wetted parts, and comes in a gauge size of 4 ½", used for applications needing panel mounting. The Model 1933 process gauges have a cast aluminum solid front flange case for maximum operator safety with a lower-back mount ¼” or ½” NPT process connection. Model 1933 pressure gauge is supplied in many different ranges including vacuum, compound, and pressure ranges from 30" Hg vacuum through 11 600 psi. 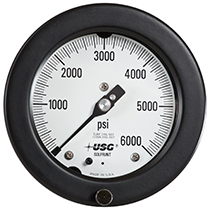 Dials are available in psi gauge or metric versions.